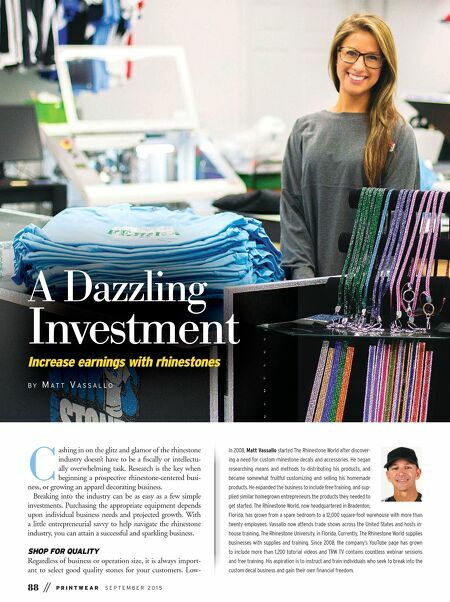 A Dazzling Investment Increase earnings with rhinestones B Y M A T T V A S S A L L O 88 || P R I N T W E A R S E P T E M B E R 2 0 1 5 C ashing in on the glitz and glamor of the rhinestone industry doesn't have to be a fiscally or intellectu- ally overwhelming task. Research is the key when beginning a prospective rhinestone-centered busi- ness, or growing an apparel decorating business. Breaking into the industry can be as easy as a few simple investments. Purchasing the appropriate equipment depends upon individual business needs and projected growth. With a little entrepreneurial savvy to help navigate the rhinestone industry, you can attain a successful and sparkling business. SHOP FOR QUALITY Regardless of business or operation size, it is always import- ant to select good quality stones for your customers. 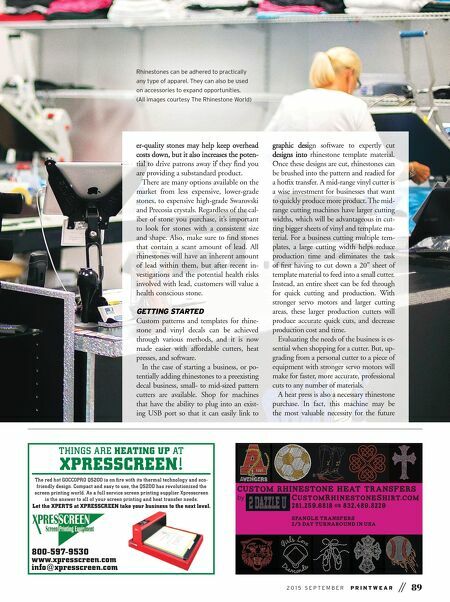 Low- In 2008, Matt Vassallo started The Rhinestone World after discover- ing a need for custom rhinestone decals and accessories. He began researching means and methods to distributing his products, and became somewhat fruitful customizing and selling his homemade products. He expanded the business to include free training, and sup- plied similar homegrown entrepreneurs the products they needed to get started. The Rhinestone World, now headquartered in Bradenton, Florida, has grown from a spare bedroom to a 12,000 square-foot warehouse with more than twenty employees. Vassallo now attends trade shows across the United States and hosts in- house training, The Rhinestone University, in Florida. Currently, The Rhinestone World supplies businesses with supplies and training. Since 2008, the company's YouTube page has grown to include more than 1,200 tutorial videos and TRW TV contains countless webinar sessions and free training. His aspiration is to instruct and train individuals who seek to break into the custom decal business and gain their own financial freedom.